Looking at a picture of Martha Ann Lillard smiling in 1953 can really stir your emotions. The five-year-old’s bright facial features capture the joy of a kid who knows of a world of no wrong. But Lillard’s body tells a different story – it’s obscured by a giant iron lung respirator. Unfortunately, Lillard wasn’t unique at the time. It took the U.S. another 26 years to eradicate the virus that had paralyzed her – polio. Poliovirus, or polio as it is commonly called, is a dangerous and highly contagious virus that generally targets kids under age five but can potentially affect anyone who hasn’t been vaccinated, says the Mayo Clinic. It can spread through direct contact with someone carrying the virus or through contaminated food and water. Feces of carriers are also highly infested. Nonparalytic polio, on the other-hand, looks like the flu. Symptoms can last up to 10 days, but usually goes away after 2 to 52. Thankfully, poliovirus is almost a thing of the past. Since 1988, with the launch of the Global Polio Eradication Initiative (GPEI),4 polio has dropped over 99% worldwide. From 350,000 cases to 22 in 2017,7 the initiative is clearly getting closer to its goal 30 years in. While the future seems bright, the struggle isn’t over. Polio is still found in parts of Africa and Asia and has had a constant presence in Afghanistan, Pakistan, and Nigeria. If not eradicated, the virus has the potential to affect up to 200,000 people worldwide in just 10 years, according to the World Health Organization (WHO). To date, there is no cure for polio, but there are effective vaccines.1 As history has shown, immunization holds the key for a bright future. 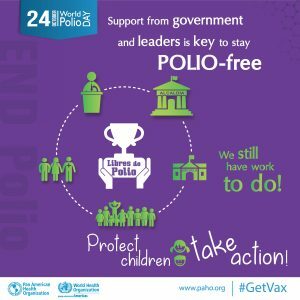 In commemoration of Jonas Salk’s birthday who led the team that developed the first polio vaccine – inactivated poliovirus vaccine (IPV), Rotary International established World Polio Day on October 24 over a decade ago7. In hopes of a polio-free future, Delmar Nursing and Rehabilitation is proud to raise the banner of vaccine awareness this World Polio Day. Do you have a loved one who was affected by polio?